WASHINGTON — Senator Richard M. Burr, the head of the Senate Intelligence Committee, warned American corporations on Wednesday that using Chinese technology in next-generation telecommunication networks could pose security risks, but stopped short of endorsing a ban on such equipment that the Trump administration is considering. 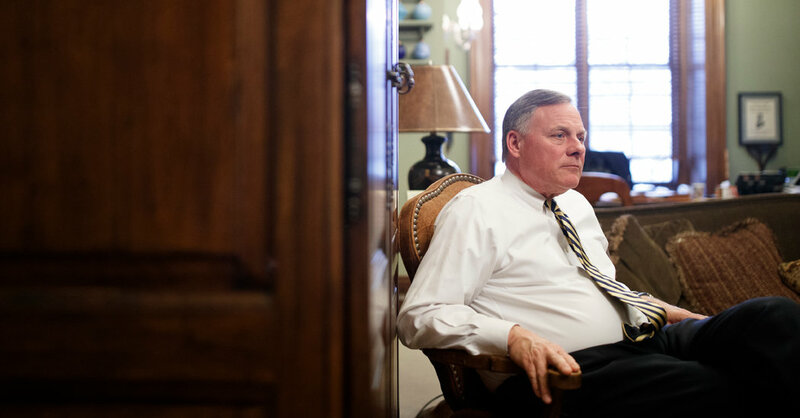 Mr. Burr, Republican of North Carolina, said in an interview that China was making investments in key technologies, like the kind that will power fifth-generation, or 5G, cellular networks, to have “economic dominance, military dominance” over the United States. The Trump administration is considering a broad executive order banning American telecom companies from using Chinese equipment and software in new wireless networks, and has pressured allies to block Huawei, China’s leading telecommunications producer, from having a prominent role in building their 5G networks. The administration contends that whichever country dominates 5G could gain a long-lasting economic, intelligence and military edge, and has accused China of trying to secure an advantage at America’s expense. Last year, Australia banned Huawei and other Chinese companies from competing to build the 5G network in that country. Mr. Burr said the Senate was not looking at the problem with the idea of “banning or forbidding products,” suggesting such a ban would be at odds with the American system. He drew a comparison between Huawei and Russian software companies, whose use by American businesses declined once the United States government deemed their software too risky for its own computers. Mr. Burr’s remarks came as the Department of Homeland Security conducted an educational session for American companies to warn them about broad and persistent threats from China to steal their technology, particularly by hacking cloud-based services. Telecommunications companies have met with Mr. Burr and the top Democrat on the committee, Senator Mark Warner of Virginia, and the two men have laid out their concerns about Huawei and other firms. Mr. Burr said the American government had become more open about what it shares with businesses and educational institutions about the threat from China. “It is absolutely a necessity for us to share with whoever what the risk is of making a cost-based decision versus a security-based decision,” he said. Huawei’s equipment can often be purchased at cheaper prices than that of American or European competitors. The 5G fight is only one front in an increasingly hostile battle over technology and trade between the United States and China, with Mr. Trump imposing tariffs on hundreds of billions of dollars of goods and accusing the Chinese of “stealing our intellectual property.” Mr. Burr predicted that the United States is likely to sharply reduce education visas for Chinese students, as it tries to limit the threat of American research and technology being taken back to Beijing. “I am more concerned with the fictitious effort to be educated in America — work for 10 years — with the full intent to bring back to China everything you can learn, store or steal,” Mr. Burr said. The senator said he had met with leaders of universities in his state, which include elite institutions such as Duke and the University of North Carolina, to warn them that the number of Chinese students is likely to decline. Chinese nationals make up a large number of students, particularly in graduate math and science programs. National security officials have warned that not enough guardrails are in place to prevent students from taking technology, data and know-how back to China. Mr. Burr said it was difficult to sort out students who might be intent on stealing secrets from those who simply want an education and a life in the United States, suggesting that reducing visas was the only viable solution. Chinese visas have been declining in recent years, although that is at least in part because of a change in the length of visas. Mr. Burr also said American corporations must be more careful when investing in China, and realize the danger posed by using Chinese-made networks and storing their data in China, where the government in Beijing can gain access to it. That was the goal on Wednesday of the Department of Homeland Security’s session for businesses on Chinese espionage. The department’s Cybersecurity and Infrastructure Security Agency highlighted how China was working to infiltrate cloud services and managed service providers, which offer remote information technology services to companies, to steal data. Groups like APT10, an arm of China’s spy service also known as Stone Panda, have used open source hacking tools and phishing attacks to steal credentials and then penetrate data stored in the cloud. The technology targeted by China is from the industries that Beijing has said it wants to dominate in its China 2025 strategic plan, said Rex Booth, a member of the Cyberthreat Risk Analysis Team at the department.